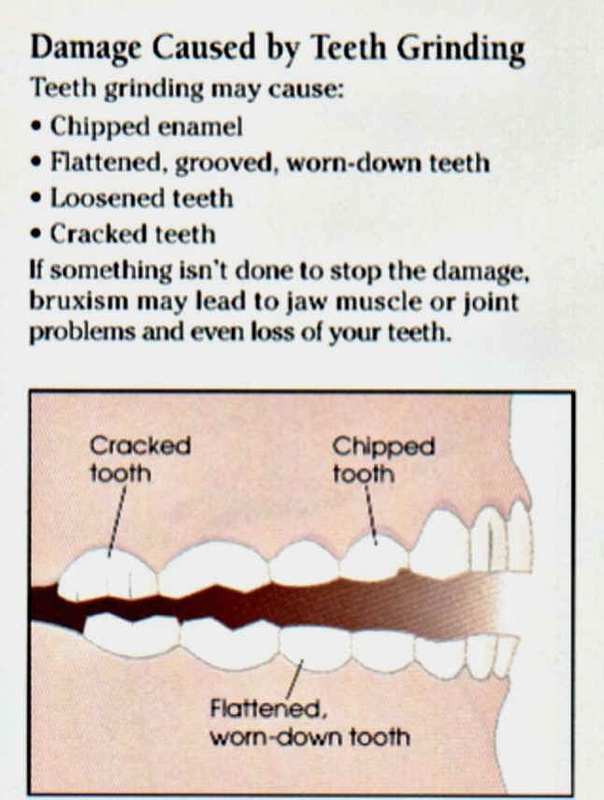 "Bruxism" means grinding and/or clenching of teeth. It is considered a nonfunctional habit of the that can occur while awake or asleep. Grinding your teeth while asleep is more of a problem since most people will grind their teeth much harder than t hey ever would while awake. Such "Nocturnal Bruxism" is a very common sleep behavior that a many people will experience at some time in their lives. It often is more evident during times of personal stress. Important Note: Recent evidence indicates that use of selective serotonin reuptake inhibitors (SSRI's Paxil, Prozac, Zoloft, etc) can significantly increase bruxism and even result in TM Disorder symptoms. We have seen this in our office as well with our regular patients. A nightguard, such as the FDA approved NTI Device, is the best treatment for bruxism. A nightguard is a thin piece of hard plastic made from impressions of your teeth placed on the upper or lower teeth. The nightguard is hard enough to be durable, but since it is softer than teeth it will protect them from wear. When the nightguard is tried in, it is adjusted to fit your bite evenly and smoothly. This appointment may take a while, but it is very important that the fit of the night guard be just right. The NTI Device is much easier to wear and is fit to your teeth in only one appointment. It attaches to your front two teeth only causing the posterior teeth not to touch at all. This alignment suppresses clenching over ninety per cent, causing the jaw muscles and joints to relax and heal. Also, since the teeth are out of contact no wear occurs. Bruxism is a problem if evidence of worn enamel exists and/or if painful jaw symptoms develop. One can grind their teeth so hard that significant amounts of tooth structure can be lost over time. This insidious destruction of enamel can be quite extensive, causing more loss of tooth structure than even severe tooth decay. Typically this happens with no awareness by the patient since there is no pain or visible cavities in the teeth. Nighttime clenching, more subtle than grinding results cracking and fracturing of back teeth. One major goal of a nightguard or NTI is to stop this destruction of tooth structure as soon as possible. Otherwise, the teeth effected would need extensive, costly dental work to be restored. Often nighttime bruxism is accompanied by pain in the jaw joint and/or muscles. A nightguard is one of the most important steps in relieving this problem, known as TMD (temporomandibular disorder). Even if no pain is present, wearing a nightguard may aid in preventing the development of this painful problem, and protect the jaw joints from excessive pressure that may lead to damage in them. You need to wear the night guard each night for it to work properly. It takes a few nights to get adjusted to, but it is usually comfortable to wear.